Iran’s semi-official Fars News published a report on Iran’s new “homemade supersonic fighter jet” the Kowsar. However, the jet pictured was neither new nor entirely “homemade”. It was in fact an Azarakhsh, an upgraded F5 that was first introduced to the Iranian Air Force in 1997. That’s more than twenty years ago. So why the Iranians should release photos of a “new fighter” that is in fact more than twenty years old is anyone’s guess. It may have been due to sloppiness on the part of the Iranian Air Force’s publicity department but the Western media seized upon it with glee. As the following report reveals, Iran’s announcement of a “new fighter” provoked derision among western observers. Its close resemblance to the US-made F-5 fighter has raised doubts about how effective it would prove to be in reality, something Iran’s opponents have been quick to seize on. 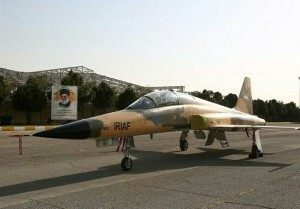 Despite the Western derision Iran does in fact have a new fighter jet. Designed to perform as an advanced trainer/close air support plane the Kowsar is thought to be based on the AIDC AT-3 Tzu Chung, an aircraft developed by Taiwan in collaboration with Northrop between 1984 and 1990. Iran has made much progress in developing an indigenous arms industry, especially in the field of air-defence and radar. However, PR blunders like this serve to undermine any gains from previous publicity. Ed.